I just received word that my thesis film 'My Big Bad Wolf' (2013) is an Official Selection chosen to screen at the Finow International Film & Script Festival in Germany in just a few weeks! I entered this festival nearly a year ago, submitting my thesis film to the 'best student screenplay' category. After all, I did make the film back in school! The primary objective of the festival is to provide a platform for talented independent filmmakers and writers from around the world who are trying to increase their distribution and production opportunities, to discover new names, to make connection between them and World. You can see more from 'My Big Bad Wolf' online, and can add the event to your online calendar, too! You can even join the Facebook event page if you feel like supporting the film, and the festival! My Big Bad Wolf Kickstarter Launch! Last week my short film 'My Big Bad Wolf' (2013) received the Experimental Award of Recognition from The IndieFEST Film Awards! Currently in its 7th year, The IndieFEST Film Awards is an avant-garde worldwide competition that strives to give talented creators the positive exposure they deserve. The IndieFEST promotes award winners through press releases to over 40,000 filmmakers, industry contacts as well as five additional global media/distribution outlets. We are currently creating a filmmaker representative program to assist with the distribution of award winning films. There are loads of award categories, and so many great films! The 'Recognition' prize may seem small compared to other awards, but I'm glad I shared my work with a few more people! And let's be honest - film laurels look awesome. 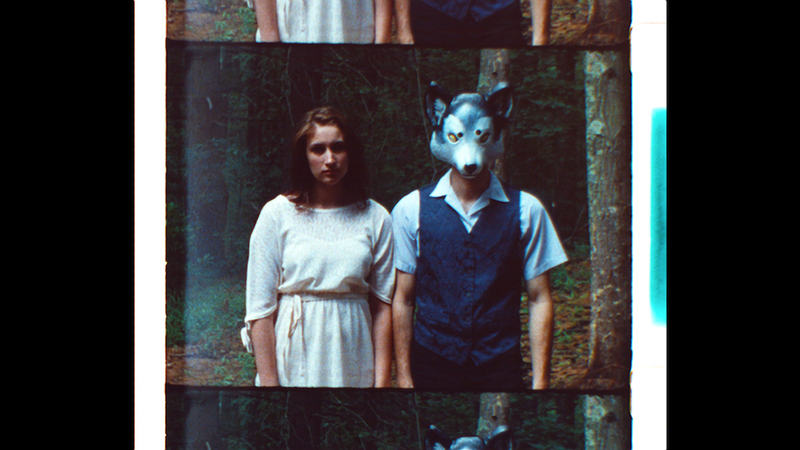 'My Big Bad Wolf' focuses on a couple living in the woods, a nondescript place out of time. The couple's relationship is deteriorating, as they have confused love with possession. The two bate each other, constantly playing mind games. But are these mind tricks really...games? The girl starts seeing herself - a 'double' of herself - and wonders if it is all a dream, or if her reflection has escaped into reality. Her own mind deteriorates and she is finally confronted with - herself. Check out the list of other award winners for more great work, and learn more about My Big Bad Wolf! In March when I first created my media, design and 'industry' blog site 'Meeting In The Media,' I stumbled upon FilmFreeway.com, a film submission site. The site was fantastic, so I wrote an article about them! I shared and tweeted the article, and was shortly contacted by Film Freeway - they were so complimented by my post, they wanted to use my film 'My Big Bad Wolf' to advertise a new site feature! I was delighted, and looked for a FilmFreeway email announcing their new 'public profile' option - using my profile to advertise the new feature! Unfortunately, this announcement email landed in my spam folder, but I have since found the email and am delighted to share FilmFreeway and their great, new feature! But first - yay, My Big Bad Wolf is featured in this email sent by Film Freeway to all subscribers! You can see an image of my project page with my video at the top, and my name and film title at the bottom of the email. Thank you, Film Freeway, for being awesome and sharing my name and my work! Previously, Film Freeway allowed users to create film project pages in which a user would embed all pertinent information about their film, a link to the film's trailer, production photos, and the film, itself. However, the only people who could see a user's film profile were film festivals! Now, take a look at my project profile for 'My Big Bad Wolf' on FilmFreeway.com! I've made this project profile public, so it can be viewed and shared by the world. However, the film itself is still password-protected, the password only provided to film festivals I've entered through FilmFreeway.com - a great new option! This feels like an honor, and I am so glad I found the email, this new feature, and can share FilmFreeway.com in return! Join the website and the newsletter to receive calls for film festivals right to your inbox! - don't forget to check your spam folder, too! Boston Indie Mafia Hobnob Hit! Geena Matuson answers Q +A about film 'Ice Cream For Breakfast' at Boston Indie Mafia Hobnob & Social in Somerville, 2015. Last weekend I attended the Boston Indie Mafia Hobnob & Social event as a chosen featured filmmaker, showing my short film 'Ice Cream For Breakfast' (2013)! The event was held at Arts At The Armory, and Somerville Cable Access TV (SCATV) captured interviews of each filmmaker to air on TV in the near future! Geena Matuson of 'Ice Cream For Breakfast' with Steve Anthony. 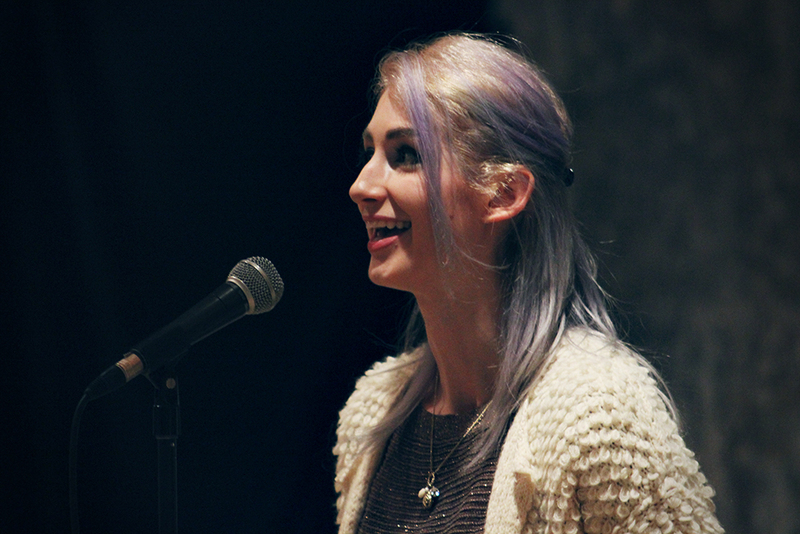 Geena Matuson of 'Ice Cream For Breakfast' answers Q/A. 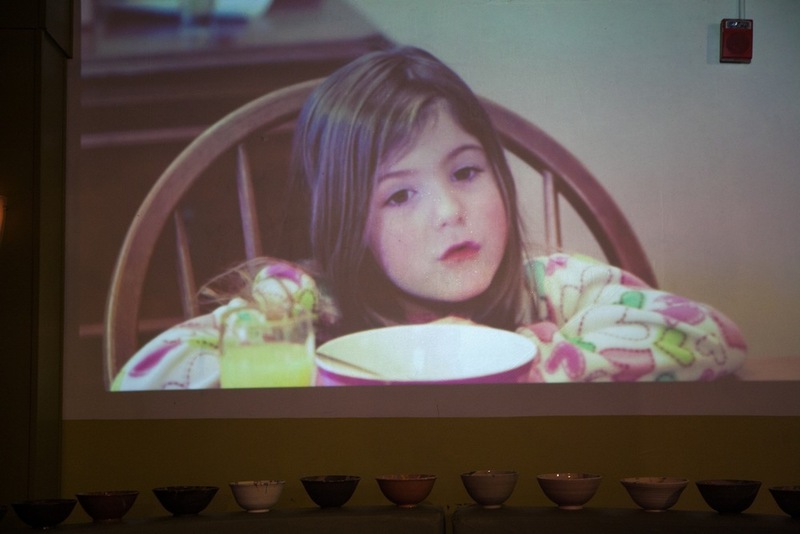 And the grand moment...my film 'Ice Cream For Breakfast' (2013) played on the big screen! In the short film, "A young girl's casual conversation with her friends leads to a troubling conversation with her mother. The film is based on a personal childhood conversation, and expresses the naivete of innocence, and the lessons of experience." This short film also landed me a semifinalist spot in the 2013 Adobe Design Achievement Awards. A strange twist, right? And again, I was told by multiple people that every child - and, more importantly, parent - should see this film, in an educational sense. And, I agree. If you have thoughts about how I can go about this, let me know! The announcer for the evening was a guy named Jim McDonough - little did I know Jim had a film featured in a previous Boston Indie Mafia event - check out his fantastic-surreal-hilarious-strange film 'Manicorn' (2013) from Friday Night Films. If you check out Danielle's Vimeo, watch 'Women In Media: A Thought Process' - it's hilarious, and I really love her voice-over. On my way up to the interview loft, I met Emily Falcigno on the stairs. Her video was calming and her voice-over was great. And, as soon as I walked down from the loft after delivering my interview, I was approached by the singer and speaker Aaron Wilson of Lead The Baseline! His voice is fantastic - and you can hear it in his music video 'Save My Life' (2014). I also spoke with writer Adam Pachter, writer of 'Final Fiction Fenway: More Stories From Red Sox Nation', actor Robert J. La Trémouille, and writer Timothy Gager. In fact, Timothy walked over, handed me a copy of his novel 'The Thursday Appointments Of Bill Sloan', and asked if I could look through it, and possibly use anything for a short film! What impressed me, I said, was the fact that he writes books and gets them published - my dream. I also met Joshua Cohen from Sonic Frame Productions, Carlo J. Barbieri III with Bad Luck Filmz - his video 'Visitant' (2013) was great; it was like an incredibly well-done study for a larger piece (which I can't wait to see!). I also had a chance to speak with Warren Lynch of Metropolitan Pictures, a video artist who so kindly shared my film online after the event! I also met filmmaker Stee McMorris of Witchworks Films who is looking to meet and collaborate with female DPs and cinematographers. So if you know them - or are one of them - get in touch, it looks like she's doing cool things! And, I met a filmmaker who knew me from Tumblr, in fact, Bob Maguire. He's into 8mm film, and we chatted; I told him it was very cool to meet people "IRL" after knowing them, or seeing their name, online! Last but not least, I met Vincent Morreale and Jan Velco Soolman of the web series 'Staying In Boston', "an independent sitcom web series about CC, a Harvard grad living in Boston, who leaves her stable job – and steady paycheck – to pursue her passion of acting" (stayinginbostontheseries.com) which you can watch online - because it's a web series! Joseph Bouvier of 'Boston Indie Mafia' put together a great production, and I would totally go to another Boston Indie Mafia event.